This summer I had an awesome August full of things that give me such joy and hope as an Asian reader and creator! I grew up without seeing myself in mainstream media and I never knew how it affected my perception of myself until I went away to college and encountered large groups of peers that looked like me for the first time (I grew up in a predominantly white area). I realized how important it is for us to tell our stories and share our identity in our work. And that’s probably why I write stories based on my Korean culture and heritage. That’s why I felt so lucky to see two major movies come out this summer based on Asian books by Asian authors. CRAZY RICH ASIANS, which is a wonderful romantic comedy with amazing sets and fantastic actors. I had to sit in the theater for a bit after the movie ended because I was so emotional that I couldn’t stop crying. They were happy tears, and part of it was because of what this movie symbolizes in terms of hope. I really wanted this movie to be amazing and when it was I just couldn’t hold in my emotions. I knew it would be a big success, I knew that people would see how much Asian creators had to offer. And that they would see that we deserved a seat at the table. I also LOVED how it presented a view into how Asian diaspora is very different than Asians living in Asia (something I struggle with every time I got back to Korea) and how there is diversity even within our communities. 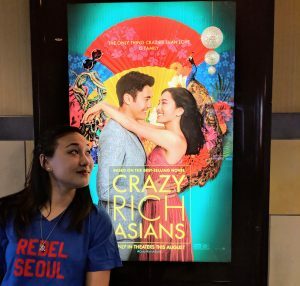 This movie gives hope to the idea that Hollywood will open its heart (and its wallet) to Asian led films (even ones that aren’t just issue driven). 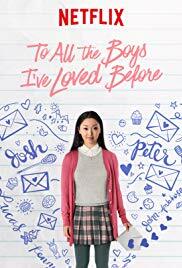 And TO ALL THE BOYS I’VE LOVED BEFORE also came out on Netflix. I won’t get too deep into what this book series meant to me as a Korean American reader (cause it would be a whole essay in itself). I will say that I cried when I read it for multiple reasons, one being that the characters and their family and their need to preserve their Korean identity felt so real to me. And I also just appreciated that it was a romantic comedy type story that didn’t make such a huge deal out of the interracial relationship. I adored the characters and how they just genuinely enjoy each other for who they are and not what culture they are. But it still had authentic respect for the diversity in the culture that was there. When I wrote my first full book (at the age of thirteen), I made the main character half Korean, half white. I did this, because I both wanted a character that looked like me and I knew the character shouldn’t look completely like me. * Not based on the books I had read as a child. And to top it off, her Korean side was not acknowledged and played no part in developing her character. This was very telling. That at thirteen I couldn’t completely create a character that was Korean in any way except a random aside comment. This came both from the fact that all the stories and movies I consumed had white characters and actors, and the fact that I grew up in a predominantly white area of Central Florida. Fast-forward a dozen years and I’m writing to actually publish. I wrote a space opera and I made the main characters (MC) white. However, this was just when We Need Diverse Books was gaining traction. It was inspiring and it made me really think about how I decided what story I wanted to tell. It made me stop and think, “Why did I make my main character not look like me?” The book was set in outer space. There were aliens with wolf-heads in my book. 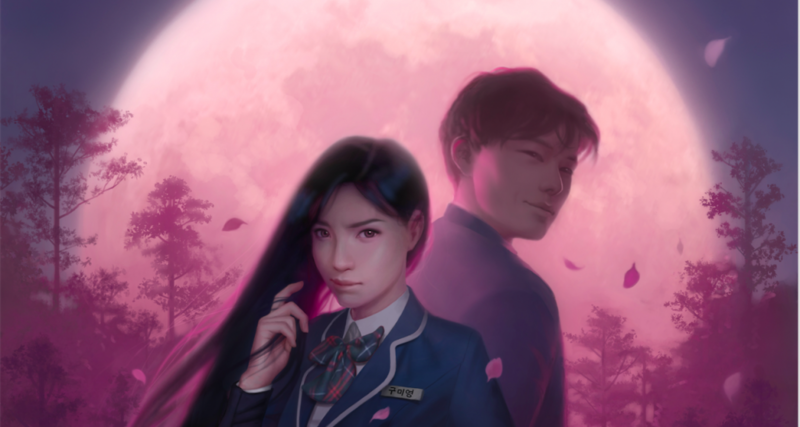 Why can’t my main characters be Korean? So I made my MC Korean. But I named him Eli. I did this because, even though I was trying to come around to the idea of embracing my identity within my writing, I still believed my culture in its entirety (e.g. Korean names) was not palatable for the current market. 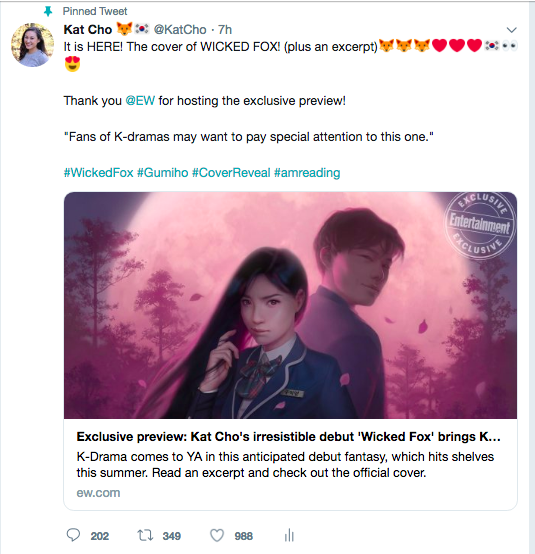 The book that actually got me where I am now is my debut novel, GUMIHO, which is based on Korean mythology, set in Seoul, with fully Korean characters in all their complexities. And that’s the book everyone was excited about. That was the book that got me an agent. That’s the book I sold to my publisher. Perhaps if I’d had books and movies like CRAZY RICH ASIANS and TO ALL THE BOYS I’VE LOVED BEFORE, I wouldn’t have thought I needed to hide my Korean side when I first started writing. Perhaps if I’d had people who looked like me in pop culture and mainstream media I wouldn’t have allowed myself to be bullied into hiding what made me Korean (aka different) in school. But now–knowing that these things can make such a huge difference–I’m more driven than ever to provide some of those stories to kids who are growing up today. Asian kids who live in areas where their classmates don’t look like them. Korean girls whose moms pack them kimbap and who watch K-dramas and who want a variety of Asian characters to choose from when they pick a Halloween costume. Also, any young writers reading this, don’t wait over ten years before you write yourself into your stories. Be proud of who you are and who you could be. Write it onto the page. Create stories that are full of your personal journey and your personal heritage. Trust me when I say that there are so many people that want to hear it and support it and champion it.